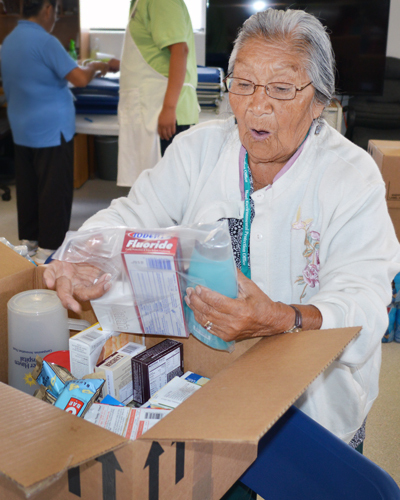 This year we provided 600 summer emergency boxes for Elders in 6 tribal communities. Laura plunged enthusiastically into her box and examined each item. 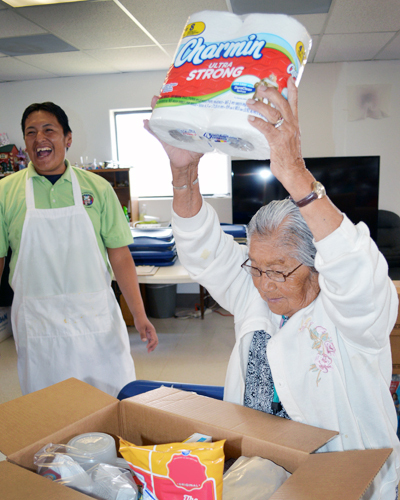 Our “Summer Box” service helps Program Partners in tribal communities equip their senior residents to weather the challenges of living in diverse climates. Elders are most susceptible to these harsh elements in both winter and summer, but many of them already live without the conveniences that many people take for granted, making our summer emergency boxes even more important. During a previous distribution in the Hopi community of Kykotsmovi, AZ, one Elder, Laura, plunged enthusiastically into her box and examined each item. She then delivered to her friends her version of “show and tell.” Her excitement spoke volumes as she held each piece high above her head so everyone could see what they would be going home with after the daily meal served to Elders. Many Elders who do not have the convenience of electricity are deprived of an air conditioner or even an oscillating fan when temperatures reach 100 degrees or higher. Elders living in low-lying areas are susceptible to flooding such as that caused by monsoons. According to the National Weather Service, monsoon season begins approximately June 15th and ends September 30th. Her excitement spoke volumes as she held each item high above her head. Each year, we select partners in communities that would benefit from providing extra supplies to their Elder populations. We are fortunate to have Gift-in-Kind (GIK) donors who provide many items that, along with purchased products, help us fill the summer boxes for hundreds of senior citizens. And these seniors are grateful for the personal care and other items that can be grabbed during an emergency evacuation. 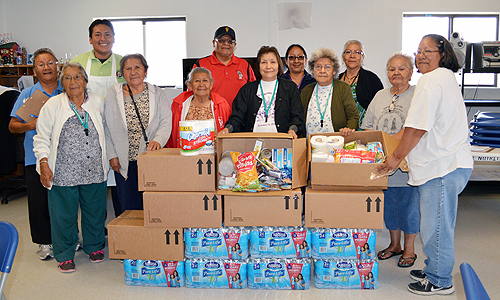 After speaking with the Hopi Elders and staff, it was clear that the nonperishable food items and water were most appreciated, as a majority of the seniors already faced living without the basics of running water or electricity in their homes. We provided 600 summer emergency boxes for distribution in 6 communities on 4 reservations in Arizona and New Mexico. The boxes included items such as nonperishable food consumable with or without electricity. First aid supplies, water, and hand sanitizers are especially helpful when water supplies are an issue. Only a few years back, the Gold King Mine spill contaminated water in numerous Native communities. Our partners are instrumental in getting these emergency supplies into the hands and homes of Elders who need them the most. Without the variety and quality of these supplies, Elders would be less prepared to handle inclement conditions in the one place they should feel the safest… their homes. With the supplies, they are more prepared to beat the heat and prepare for the unexpected.